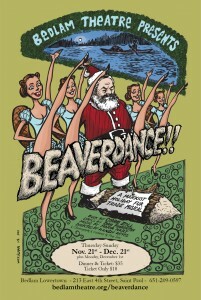 Beaverdance! A Marxist Holiday Fur Trading Musical returns to Bedlam Theatre this holiday season after premiering in 2009. This time around the show has five new songs. In this episode composer Marya Hart and lyricist Dan Pinkerton talk about ‘One Click Shopping’, a snappy, toe tapping, slightly evil song about the availability of mass produced goods. The collaborators talk about their creative decision making process and how a ‘snap’ informed their lyrics and music. It all ends with a back and forth on the compact nature of music and lyric writing for theatre. Then, of course, ‘One Click Shopping’ in-full. Beaverdance! opens November 21st. Find info and tickets here. ‘One Click Shopping’ is performed by Chase Burns, Ryan Patrick and Andrew Fleser. Mark, you did a great job of recording, interviewing, and editing. Thanks again!